"Downtime is not an option - we depend on you to depend on us." 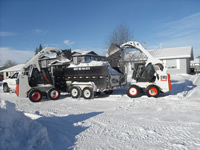 Over The Edge Yard Care Services concentrates snow plow and snow removal efforts in North Battleford,SK. Snow removal is performed on a contractual basis, from October 1 to March 31. Our most popular service is for the removal of snow after accumulation of 5cm or more, though preventative icing programs are also available. 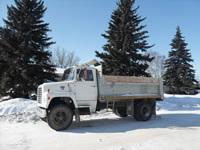 Our experienced teams are on-call 24hrs a day for snow removal from your parking lots, laneways, walkways and sidewalks. We use commercial grade equipment – and old fashioned elbow grease – to keep your property safe, convenient and attractive through the worst mother nature has to offer. All of our team is drug and alcohol tested. We are fully insured for $3,000,000, and we are also WCB certified and claims free.